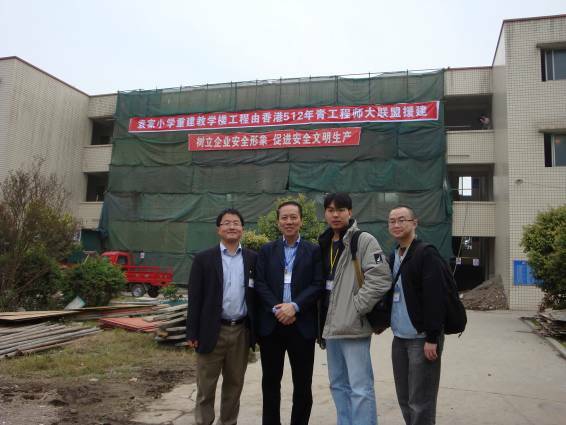 On 10 April, Dr. Wilton Fok, Dr. YC Wu and Dr. Alfred Yu met with the Sichuan Deyang Education Bureau for the preparation of a primary school reconstruction in summer 2009. The team will lead a team of HKU students to Deyang to install renewable energy system, multimedia classrooms and a computer laboratory in the Deyang Yuanjia Primary School. They met with the school principal, local government officials and the local engineering team. They followed up the construction progress and discussed the engineering arrangement for the reconstruction work preparation.